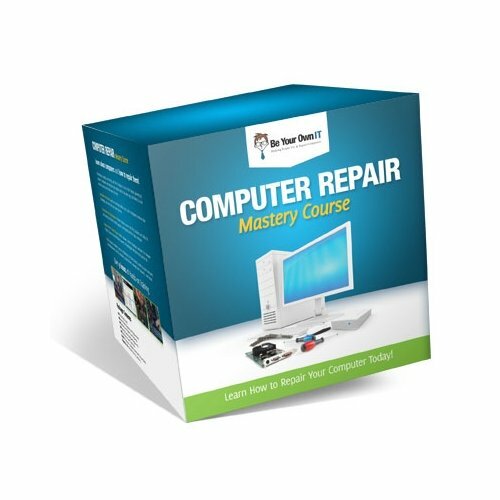 The goal of this tutorial is to have you set up wireless network so you can understand the wireless networking basics. If you already have your home wired network setup, then you can add a wireless access point to extend your home or business network with a wireless signal. Portability: you can take computer anywhere in the house, even if your house is huge you can add wireless range extenders and access points. Flexibility: You are not limited to a specific part of the house. In a wired network you have to stay near an Ethernet jack in order to stay connected to the network. No wiring along your walls or under the rug. In a wireless network, it doesn't matter if you have DSL or Cable Internet service, a wireless router will function with any. 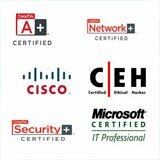 Your network devices like computers and printers need a wireless network adapter. The wireless network adapter sometimes called a network interface adapter can be added to a computer that does't have wireless capabilities. Most new computers come with one. If your computer does not have one already then I recommend you buy a USB wireless adapter. It is much easier to install than opening your computer to install a PCI wireless adapter. 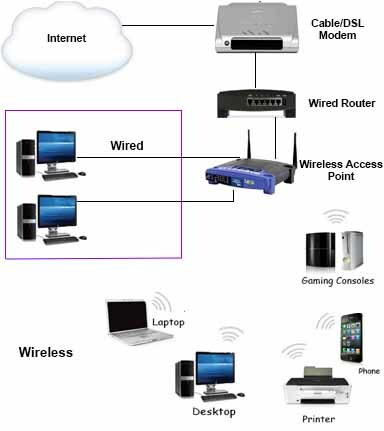 When a wireless device communicates with other computers or devices through an wireless access point, then it is operating in infrastructure mode. This is the mode we will use when we have a wireless router or access point. 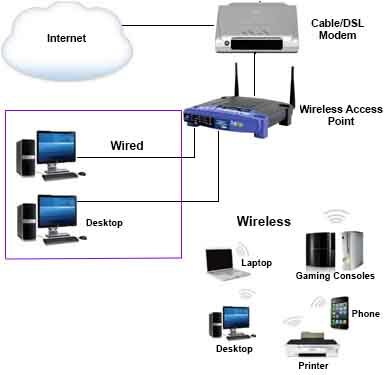 When two wireless computers can communicate without a wireless access point (AP), then they are capable of establishing an ad hoc network. You can create a home network using the ad hoc mode and without an access point present. This mode is not really used much since you can get a wireless access point for a cheap price. But in a rare case where you have two computers with wireless capabilities and no AP, then go for it. 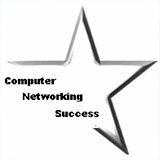 With an ad hoc network you can transfer files and documents between two network computers. So let's say you don't have a router or access point in the house. You only have a DSL or Cable modem and it doesn't have the wireless capability. 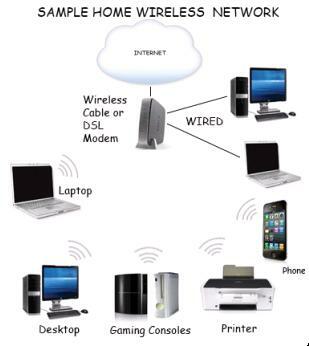 You can connect your computer and share your Internet wirelessly to the other computers in your home. Your computer just became an access point and is taking advantage of Internet Connection Sharing. In my opinion, with the low cost of home routers today, you will benefit more with a wireless router than using ad hoc configuration. A wireless router (access point) can connect hundreds more network devices than an ad hoc network. New routers all come with the 802.11n wireless standard. It has an improved range of signal and faster speeds. 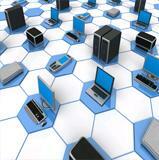 Wondering how your wireless network will look from a glance? If you already have a home wired network, then you can add a wireless access point to set up wireless network. 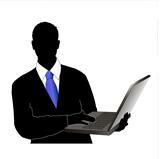 Most of the time your Internet Service Provider (ISP) will provide you with a built-in DSL or Cable router. This router eliminates having two devices to configure and allows you to only have one router which connects to your ISP and connects your wireless devices to set up wireless network. In the previous picture, the wireless router has a built-in 4 port switch. Most home routers have a built-in switch. You can connect any network device to an available port with an Ethernet cable. You can benefit with faster network speeds when connecting a device with a network cable but the flexibility of going wireless is unmatched. If you have a lot of computers at home, it can look very ugly if you run cables everywhere. Having a wireless network eliminates that. When having a wireless network, won't everyone see my signal? That is true, they can see your wireless signal if they are in range, but don't worry you can configure your wireless router to use wireless encryption and this will help secure your home network. I recommend you don't use WEP because it is easy to crack. Instead use WPA version 2 and your home network will be secure from hackers. Quick guide on wireless encryption. If you are still a little paranoid, then read my article on "Tips for Securing your Wireless Network"